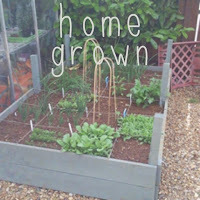 As you've probably guessed from the books in my 'on my bookshelf' I have a passion about home grown produce and cooking, my 'grow your own' journey started about 15 years ago when I became aware of organic food and at the time could not afford to buy the vegetable boxes that were on offer. I realised that I could resolve this issue by growing my own staples, then purchasing the more usual vegetables that were difficult to grow. I also loved the idea of eating seasonally, as a vegetarian, it’s very easy to get into an eating rut I found myself eating carrots, green beans and potatoes all year round, I craved variety. Over the years I continued to grow my own vegetables and eventually had an allotment but found it was too much to cope with. I supplemented what I was growing myself with things that were difficult or impossible to grow in the UK, like melon, bananas or things that took up too much space and were cheap like potatoes and onions. I preferred to concentrate on outdoor tomatoes, herbs, beetroot, carrots, salads, chard, garlic and shallots. I soon found myself automatically eating with the seasons because that's what I had on offer! When we moved (4 doors down!) in 2009 we were super excited to have more space to create growing areas and we finally had a greenhouse. We were ecstatic! By this time the hubs was getting interested in gardening and also started expanding his vegetable tastes from carrots and potatoes to salads and beetroot. He also really appreciated the taste of home grown carrots and potatoes, we used gardening as a form of family activity involving the children in the planting, preparing and eating of the food we grew. Homemade pizza became a staple in our home, using herbs, tomatoes and vegetables that the children had picked fresh, they loved it. Our eggs were purchased from a neighbour and we regularly ate homemade quiches, salads and new potatoes. We moved in June so it was too late to do anything for the summer season, we also didn't have any vegetable beds in which to grow, in 2010 the hubs spent time putting in a great raised bed which gave us a lovely starting plot, that first year we used the square foot method detailed in Carole Klein's grow your own veg, it was a great success but didn't really provide enough food or us, I needed to work out how to succession plant to extend our planting season. I planted in the greenhouse and we also purchased 10 large buckets from a hardware store which the hubs drilled holes in for us to grow new potatoes in. That meant that we had more space to grow in the bed. I also could expand the my varieties by planting in the greenhouse - something that I'd dreamed of for ages. I planted pepper's, chilli's, aubergine's, cucumber and a wider variety of tomatoes and salad leaves, we had salad for lunches throughout the summer, the freezer was full of tomato sauce and ratatouille, that summer we ate like royalty. We tried planting our beans and courgettes around the garden as recommended in Alys Fowlers The Edible Garden, this also freed up much needed space on the plot and was a great success. The next year everything was prepared and sown and then in the May we found out we were expecting T, everything went on hold and from then until now and we've never really got back on track. Both the hubs and I are really keen to be producing good quantities of veg next summer, there's so much in the garden that needs doing first though, we really need to make a start on the work. 1. Clear the vegetable garden area of the garden. 2. Turn over the raised bed. 3. Decide what to plant and where. 4. Plan when to plant. 5. Sow seeds for winter salads now. 6. Clean and tidy the greenhouse, fix broken pane. 7. 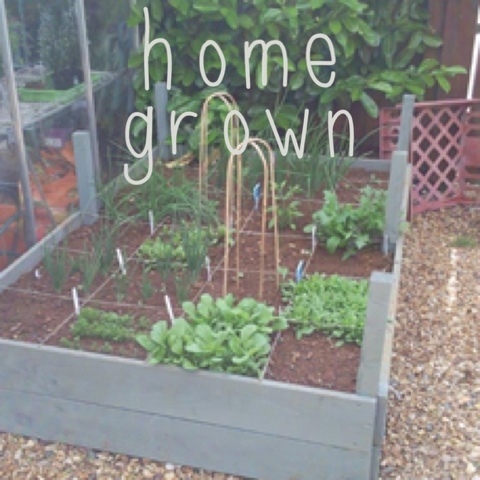 Identify and clear other areas in the garden to plant. Now that the seeds are all nicely organised, it's going to be easy for us to plan for next year, I'm looking forward to spending a nice cosy evening in front of the fire with a bottle of wine and the hubs, going through the seeds and books making our plans for next year. We are also going to be concentrating on things that we'd like to grow to preserve and seek out our local farmers markets and possibly ordering a box scheme over the winter. The picture above shows our beautiful raised bed that the hubs made. I can't wait to come back to you with progress, plans and updates! I once its all prepared we'll do a garden tour post to show you round our garden and growing areas.